Well what can we say about this doll. She is all original and is still tied at her waist and feet with original plastic ties. Shirley is a plastic/vinyl doll from 1972 made by Ideal doll company and manufactured in Hong Kong. open plastic brown eyes, with fringed original eyelashes to both of her eyes. blonde hair has the original hairnet over her original curls and she has her original red ribbon in her hair. head, arms and legs can be moved to different positions. her original red and white spotted Stand Up and Cheer dress which seems to be almost in pristine condition. her original long white socks and her red shoes. This doll has obviously been looked after, and has been in someone's doll precious collection. She comes in her orginal doll box which is does show quite a bit of wear particularly at the top of the box. We have retaped it to prevent further damage. The cellophane window has many tears to it. Shirley is just gorgeous and appears to almost brand new. This doll appears to have never been played with and has spent its entire life in the box. Shirley is a plastic/vinyl doll from 1972 made by Ideal. Shirley is a gorgeous cute doll, and her face has open plastic hazel/brown eyes, with fringed original eyelashes to both of her eyes and those famous dimples beside her open pink painted mouth. Her rooted blonde hair has those famous Shirley Temple ringlet curls at the sides and curls at the back of her head. Her head, arms and legs can be moved to different positions and she can stand and sit by herself without assistance. She has good colour over her body, has no nibbles on her fingers or toes. She comes to you in her all original costume . 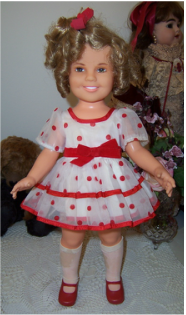 Shirley is a very pretty collectable doll and is always a favourite. She comes to you in her an original Danbury Mint Yellow Stowaway outfit. We have the box and original certificates for this outfit. She will also come with a vintage sepia coloured photo (copied) of Shirley Temple actor wearing this dress. Shirley is a very pretty collectable doll comes in a Danbury Mint Stowaway out with its original box COA and sepia photo. Shirley is a plastic/vinyl doll from 1972 made by Ideal and comes to you in her original box (very tatty but lovely pictures of Shirely Temple actress on it) and she still has her original hairnet on her hair. She is marked on her back and head. Her face has open plastic hazel/brown eyes, with fringed original eyelashes to both of her eyes and those famous dimples beside her open mouth. Her rooted blonde hair is in original curls, and has been protected by her original hairnet. 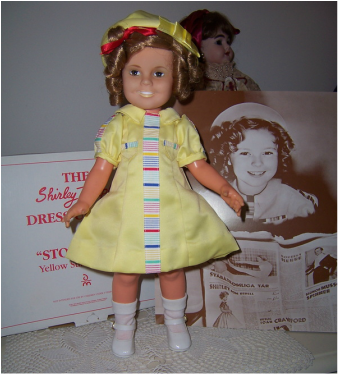 Shirley is a very pretty collectable doll and is always a favourite even though she is 44 years old.